Relying on third parties to support your core operations is easier and more feasible than ever. Relying on third parties to support your core operations is easier and more feasible than ever. The trouble is, they often process sensitive or personal information on your behalf, potentially exposing your business to risk. In short, you call us. Using a simplified and practical approach, our consultants help you identify your actual risks quickly and cost-effectively, ensuring efforts are focused in the right place. 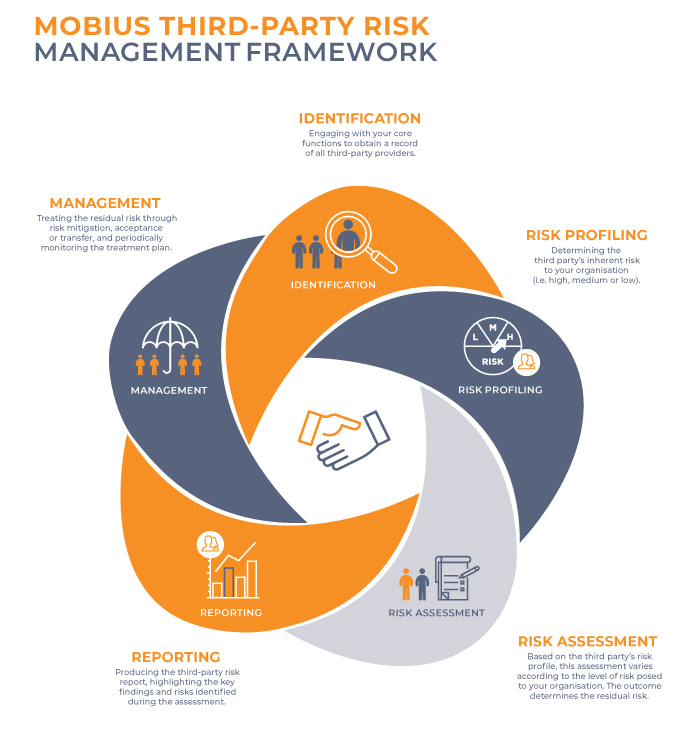 Your tailored Third Party Risk Management programme also allows you to easily assess all your future third-party relationships, continually empowering you to make the right choices about who you work with. What’s more, our services are fully supported by a powerful technological edge. Triplicity, our flagship cloud software, can facilitate the entire process effortlessly, giving you a single tool for everything from third-party profiling and risk assessment right through to managing remedial controls. ﻿﻿Your browser does not support the video tag. Mobius Consulting Copyright © 2019. All Rights Reserved. Website and SEO done by Engineered Media.